When we practice together, the energy is that much greater! 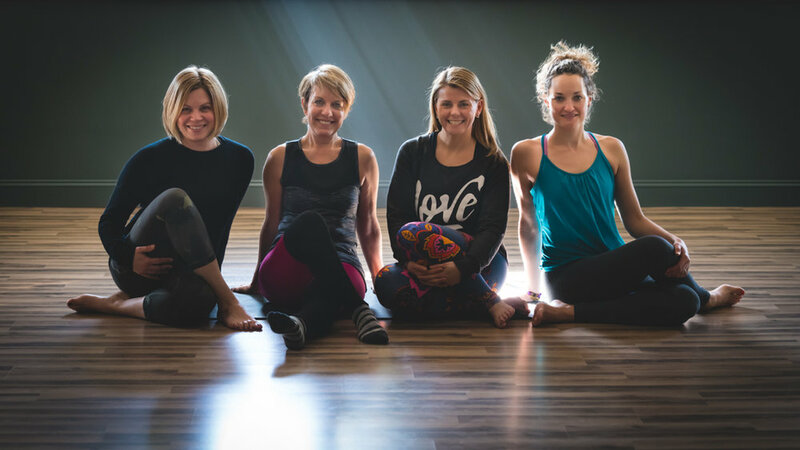 Neighbors, friends, and Yoga: From L to R Jackie Terribile, Tracey Montague, Sophie Tashkovski, Annie Taylor. There is something magical about knowing the people you practice Yoga with. The energy shared around the room is strong-you feel connection to the people around you through the practice, and you share in each other's Yoga journey. I feel this in all the classes I teach at Syracuse Yoga and it's amazing! I opened the studio to bring people together, to build community through Yoga practice, and to create a space where Yoga is taught safely and correctly, with every teacher being each student's partner on their Yoga journey. It is happening, and it is wonderful. On Tuesday mornings we have a group of women who show up each week for a Yang Yin class. Yang Yin is a favorite class of mine, because it gives you the best of both worlds-movement with Vinyasa Flow and deep stretching with Yin. These ladies start their day with me, and I have been watching them grow in their practices, building strength, and improving flexibility. Jackie said on Tuesday that she will never miss a Tuesday again. Annie said Yoga made her feel so good she wants to try to get to Syracuse Yoga everyday. Tracey expressed how much she missed Yoga when she was down and out with a cold last week. When students share their love for Yoga and Syracuse Yoga I am overjoyed. It is the best. Knowing other people are going to be at class is a great motivator to get you there on those days when you think you are too busy, or too tired, or it would just be easier to stay home in your pj's. We all have those days. Your community is looking for you to show up! I haven't met anyone who regretted going to class. We're waiting for you to join our Syracuse Yoga community! We'll be on this journey together. So, grab a friend, a family member, a co-worker...use the buddy system, or just show up and get to know our community. I promise the energy of it all is contagious. See you on the mat!